Towards the end of last week, autumn arrived in earnest. Until then, it felt a little like we were living on borrowed time: sunny days and warmth that extended into the evenings even after darkness had fallen (and did so increasingly earlier every day). In my inbox, however, autumn arrived about a month earlier: it’s easy to define the seasons by what fellow food bloggers are raving about and on arrival back from honeymoon my virtual world was a veritable celebration of all things pumpkin. We don’t eat a lot of pumpkin in the little loaf house. I think I associate it with the oversized, often tasteless giants we used to hollow out as children on Halloween, but after seeing so many beautiful recipes involving its sweet, orange flesh, I finally felt the need to add pumpkin to my repertoire. The recipe I kept seeing and couldn’t get out of my head was granola made with pumpkin purée, and after roasting some up for a quinoa salad, I had just enough left over for this breakfast experiment. Apples are a perennial autumn favourite and the perfect partner for the flavours of cinnamon and spice I was planning to add to my pumpkin. Recently I saw the lovely chef Tom Kerridge make an amazing ‘apple caramel’ on TV by simply reducing the juice in a pan – Luise and David over at the gorgeous Green Kitchen Stories do something similar but call it syrup (which sounds a little more breakfasty in my book) – so with both these recipes in mind, I decided to sweeten my granola with apples rather than the traditional sugar or maple syrup. Apple juice is reduced into a sticky syrup with a stick of cinnamon and some star anise. Added to this are rolled oats and rye, olive oil, sweet roasted pumpkin and its dried and toasted seeds. What I love about this recipe is that it feels close to nature: the apples and pumpkin almost in original form, the seeds getting a new lease of life as bursts of toasty crunch alongside creamy roasted nuts. I’ve been packing this granola into pots for my post-gym workout, mixing in yoghurt and grated pear before scattering with jewel-like pomegranate seeds. It’s also delicious on top of a smoothie bowl, sprinkled over ice cream or eaten by the handful straight out of the jar (as evidenced by the trail of crumbs round the kitchen that appear every time Carnivorous Husband gets home from work before me). Place all the ingredients in a heavy bottomed saucepan over a high heat and bring to the boil. Reduce the heat and simmer, stirring occasionally, for 45 – 60 minutes or until the apple juice has reduced to about 250ml syrup. This is more than you will need for the granola, but the syrup will keep in the fridge for up to four weeks. Preheat the oven to 200 degrees C. Line two baking trays with parchment paper. Cut your pumpkin in half and scoop out the seeds. Discard any stringy fibre round the seeds, wash well then dry thoroughly using a clean dish cloth. 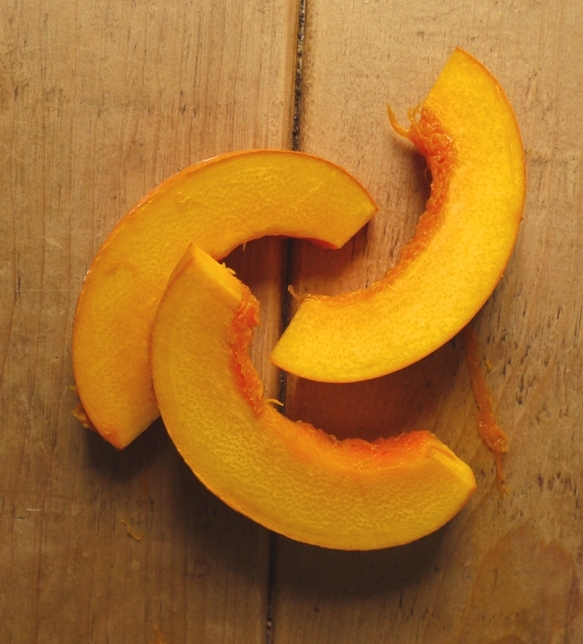 Place the pumpkin halves on one tray and bake for 40 – 50 minutes or until tender. When you have about 20 minutes of baking time left, spread the dried pumpkin seeds on the second tray and roast alongside the pumpkin, stirring occasionally to avoid burning. Remove the seeds from the oven and set aside. 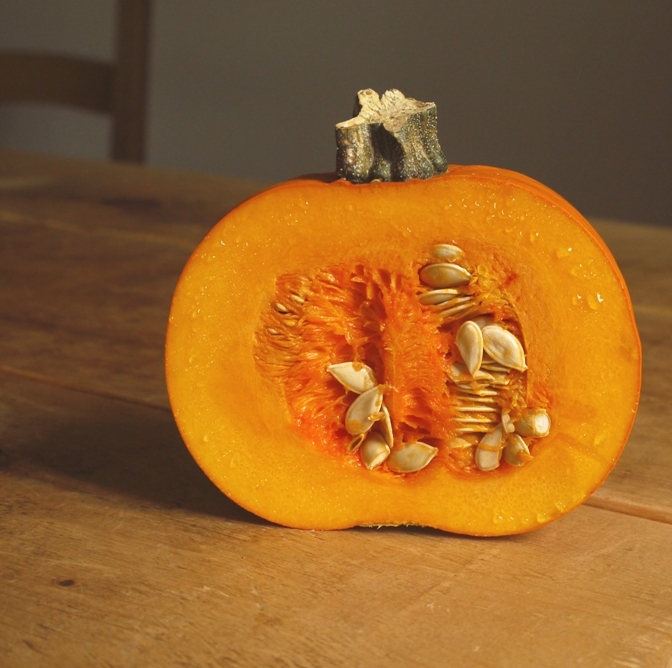 Remove the pumpkin from the oven, scoop out the flesh and blitz in a blender until smooth. 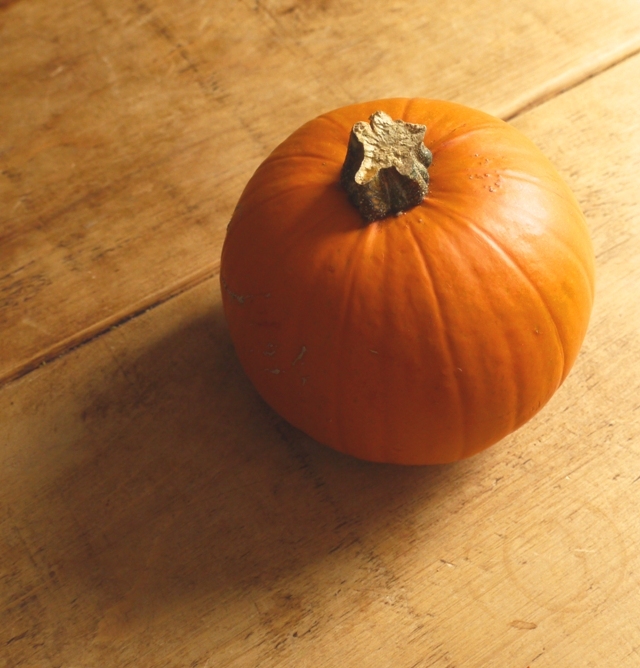 Depending on the size of your pumpkin, you’ll have some purée left over – delicious baked into cookies or added to falafel. Preheat the oven to 160 degrees C. Line two large baking trays with parchment paper. In a large bowl, whisk together the apple syrup, pumpkin purée, olive oil and salt. Add the oats, rye, pumpkin seeds and nuts and stir until combined. Spread the mixture onto your prepared baking trays, spreading out to form a thin, even layer. If your granola is too crowded it will steam and not go crisp. Bake for 35 – 40 minutes, stirring every 10 minutes or so by bringing the crispy outer edge pieces into the middle of the tray. Once golden and slightly crisp (the granola will continue to firm up as it cools), remove from the oven. Allow to cool slightly then stir in your dried fruit of choice. Allow to cool completely then transfer to an airtight container. Will keep for a couple of weeks, if you can make it last that long. Not to be picky but isn’t it Carnivorous Husband now 😉 Looking forward to trying this granola recipe out, I’ve just run out of my latest supply. It looks like that caramel/syrup does a few things here – I’m sure it brings some great flavors with nice natural sweeteners, but it also looks like it helps clump the granola up nicely. Very smart. Did you like the flavors of pumpkin and apple together? Both the flavours are quite subtle but yes, apple and pumpkin work really well together. The syrup is such a great vehicle for the spices and you do get some lovely clusters in the granola too. Nearly finished eating this batch but will definitely make again. I am such a granola addict I almost don’t dare to make this, but it looks incredibly delicious for my favorite season of the year! Love the sound of apple syrup and pumpkin puree. I have started making granola as a snack too, and in fact have a granola post coming up next week. Will give the apple and pumpkin combo a try! Looking forward to seeing your recipe! This looks so tasty! I love the appe syrup. I will definitely be trying that soon! I really like the idea of the apple syrup to sweeten it; what a perfect breakfast treat! Looks lovely! I’ve been wanting to use pumpkin in my granola recently, but I haven’t figured out the combination I like yet. I’ll have to take some tips from this! We finished the giant jar of granola at breakfast this morning so this is very timely! I haven’t tried apple syrup before. Sounds like a very good autumnal (almost Thanksgivingy) flavour combination. OOOOH this looks luscious. I sweeten my granola with apple, but a puree made from cooking apples, simmered until they turn to mush. Love the idea of this but worried I’d end up drinking the cloudy apple juice (especially if it’s Copella!) before it had a chance to reduce in the pan! Really intrigued by pumpkin in a breakfast food. I made a batch of granola this weekend though, will have to eat it quickly so I have a chance to make yours! I’ve made apple puree granola before too. I think this version makes the oats ever so slightly more crisp and I love infusing the syrup with spices (although I guess you could do that with apple pulp too). Hope you enjoy this if you end up making it – they seem to use pumpkin a lot in the US for breakfast recipes: think we need more of it here too! A lovely, lovely Autumnal twist on a breakfast favourite! I’ve too had an inbox and twitter feed full of Pumpkin recipes. Lots of lovely inspiring recipes! Oh I am in love with the autumnal wonder of this recipe. It just sounds so fabulous. And if only our squashes had come to anything this year, I would be trying it for sure. Have bookmarked in the hope we will be more successful next year OR I just give in and go and buy one. Delicious and autumnal. Just what I want for breakfast. Alas, we haven’t much in as we’ve been away! I would never have thought to use pumpkin in my breakfast cereal what a great idea and great combination of flavours! This sounds delicious, I’ll have to try it – thank you! Oh wow, I cannot wait to make this! I am always looking for new granola recipes, and this one is going to be top priority this weekend! I’ve never even thought of apple syrup – genius. 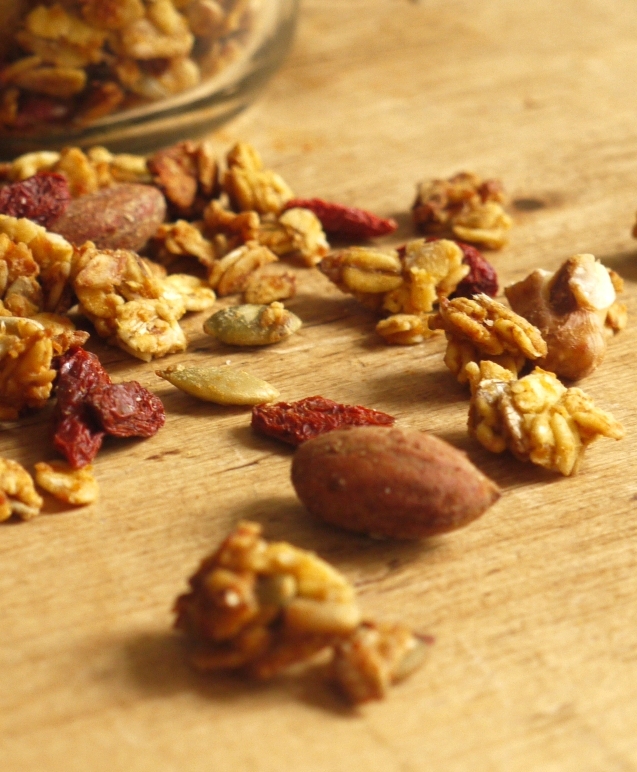 Using both apple juice and pumpkin puree, you really captured fall in this granola! I love what you said about it feeling “close to nature.” And I bet that the moisture in the pumpkin puree makes for good-size crispy clusters, which is always a treat. This looks delicious and very unique. I can almost taste what that apple juice syrup would taste like. Can’t wait to try this! Yes, pumpkins and squash are definitely everywhere these days. Good thing I am real fan and never get bored of recipes that include them. This is an original variation, thanks! I can relate to the seasons with your same comment! Especially since I live in the southern part of the world and on opposite seasons. I pinned this granola right away Kate. I had seen it made with apple juice, but never found a recipe I liked. Can’t wait to try this one, sounds wonderful! Oh yet another way to include pumpkin in every meal of the day! I’m yet to try any sweet recipe with pumpkin in it. I simply love pumpkin in savoury recipes and just can’t wrap my head around it being in a sweet dish…but you’re tempting me with this granola. I just love eating granola by the handful straight out of the jar. It’s the best way to eat it I think. It’s definitely worth trying, the sweetness of the pumpkin works really well as a breakfast food. And totally agree re munching granola straight out the jar: the best! 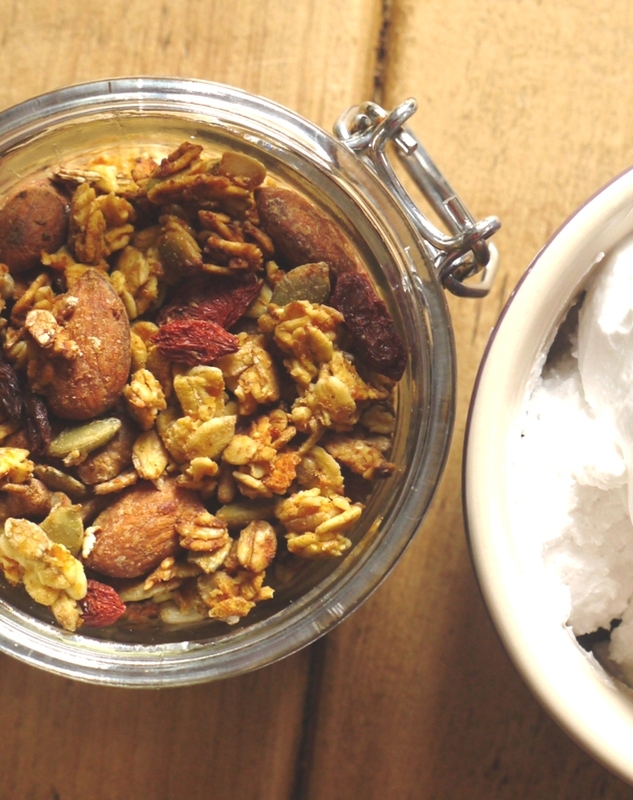 This granola recipe looks incredible! I can’t wait to try it!